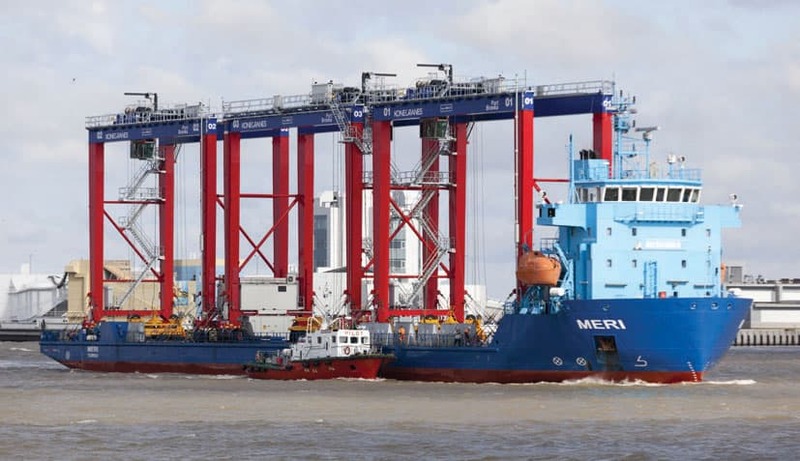 The mv Meri became the first vessel to be handled in the new Russian Baltic port of Bronka when it delivered the first three of a total of ten RTG cranes from Konecranes. Arriving from Hanko in Finland, Meri was the first merchant vessel ship to transit the recently constructed canal providing access to Bronka. Discharge of the three RTGs constituted a handling dress rehearsal at the new terminal in advance of the official start of operations in September, 2015. A second batch of three RTG cranes will be delivered by Konecranes in mid-August. The deepwater Port of Bronka is being built on the Southern bank of the Gulf of Finland, on the outskirts of St. Petersburg. Phase one will comprise two terminals plus a logistics centre. Occupying 107 ha, the 1.45m teu capacity container terminal will offer five berths on a 1,220 m length quay, while the 260,000 unit capacity ro-ro terminal will occupy 57ha with a 710 m quay that will permit the simultaneous handling of three ships. A first-stage water depth of 14.4 m will enable Bronka to handle post-Panamax vessels.